The 3 Outlet Grounded Swivel Wall Tap Adapter from SPARK is compatible with three-pronged outlets and enables users to expand an outlet that could only fit one plug into one that can fit three plugs. As this adapter features a swivel design, this helps it adjust and fit into tight spaces. 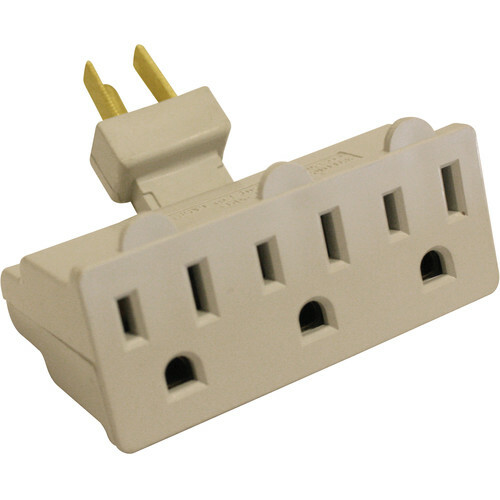 This adapter supports plugs with either two or three prongs and is power-rated for 125V, 15A, and 1875W. It it designed to be used indoors and within dry locations. 3 Outlet Grounded Swivel Wall Tap Adapter is rated 5.0 out of 5 by 2. Rated 5 out of 5 by Michael from Awesome concept Really handy for reorienting plugs to facilitate placement of furniture against the wall.